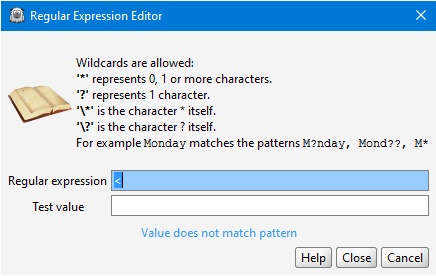 Helps to define a regular expression. Double-click on a blue or orange field opens the expression editor. It provides syntax details and a real-time test. Regular expression field contains the expression to test. Test value contains an extract of your document. The blue sentence presents the result of the test. Help button opens the online help. Close button saves the modification in the field and closes the editor. Cancel button closes the editor and leave the previous expression in the field. See Syntax examples for more details regarding regular expressions.